Not content with dressing the adults and kids of Britain Zara, the Spanish clothes retailer, have launched a new collection aimed at babies. Aptly called Mini, the new collection is targeted at babies aged from newborn to 9 months. Their Fall/Winter 2013/2014 collection is out and if you are looking for a range of girlie pinks and boyish blues this may not be the collection for you. The collection is largely based around cool neutral tones. Denim is also a key feature of the collection with traditional blue denim both for the girls in the form of cute denim dresses from only £12.99 and for the boys in baby denim dungarees and trousers between £12 and £15. The collection contains romper suits(including in denim!) which, while might look more at home at a lederhosen event, are super cute and can be teamed with a basic set of leggings and jacket. Checks and stripes also feature with check dresses and trousers and stripy tops with elbow patches giving something a little different. 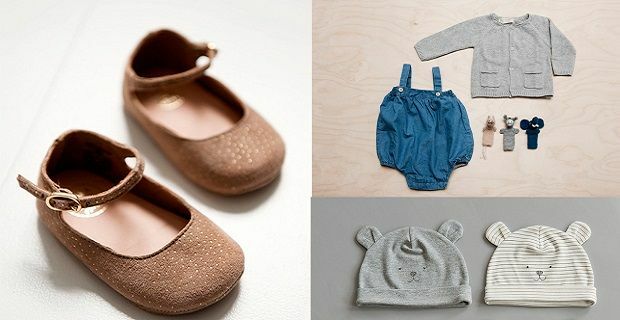 The collection includes all the usual baby basics including a few blue or pink items such as vests and bodysuits, cardigans, sweaters and bottoms. Given it’s the Autumn/Winter collection there is plenty of choice for wrapping baby up warm. Baby snow suits and jackets come in a range of cool neutral colours. With quilted versions at £32.99 and soft faux fur jumpsuits at £17.99 they are sure to keep baby snug while looking great. To top the look a cut range of hats with ears at £9.99 for two and traditional baby bonnets for £8.99. While some might gasp at the thoughts of footwear for newborn babies Zara Mini’s creations are adorable. They might not be walking yet but with little ballerina shoes for the girls and leather booties for the boys and even some running shoes for the more sporty there is no excuse not to step out in fabulous footwear and at £17.99 won’t completely break the bank. Overall a very cute collection which will have the babies of late 2013 looking very stylish indeed! The full range can not only viewed but also purchased on the Zara website (www.zara.com/uk) and of course in their stores across the UK.